The only hope is a differentiated strategy for high efficiency and high reliability! Jin-seok Choi, CEO of STX Solar, is a semi-conductor process expert who has spent years at Samsung Electronics Company. From 1984 when he joined Samsung Electronics to 2001 when he retired from the company, he had his share of contribution for the development of semi-conductor technology of Samsung Electronics. And in 2004, he worked hard for normalization of another semi-conductor company in trouble, Hynix Semi-conductor. Thereafter, Jin-seok Choi spent several years in a college teaching until 2011 when he was asked by STX Solar to guide solar energy research of the company that was suffering from over-supply in the industry. As an expert of semi-conductor manufacturing process appeared in the field of solar energy, industry watchers were not only interested in what he could do to enhance solar-energy conversion but also in enhancing productivity and reducing cost. While solar energy companies worldwide are struggling to survive in a swamp of debilitating deficit, STX Solar under CEO Choi’s stewardship attracted popular attention for its zero PID and obtaining of Japanese JET technology certification. Not only that, STX Solar also concluded a contract for the construction of a large-scale photovoltaic power generation site in Japan that is emerging recently as the most promising market. The present project—a joint undertaking of several leading Korean companies in the field of energy such as Korea South-East Power Company as the main undertaker, STX Solar in charge of EPC, and Boo-gook investment in charge of funding—is unique and unprecedented in the sense that Korean technology and capital is advancing to the solar energy field of Japan for the first time. Caption: In December 2012, STX Solar signed a business agreement to construct a large-scale photovoltaic power generation site of 45 MW class in Sendai, Japan. STX Solar has already acquired a mass-production capacity with 19 % of efficiency or higher by increasing thin aluminum oxide film on the back of photovoltaic cells to several nanometers, a technology that is used to minimize the loss of electric charge which is called ‘PERC high efficiency photovoltaic mass-production technology’. Together with this high efficiency and high reliability photovoltaic technology in the manufacturing field, CEO Choi is also planning to construct a cyberline that can be used to reduce cost. 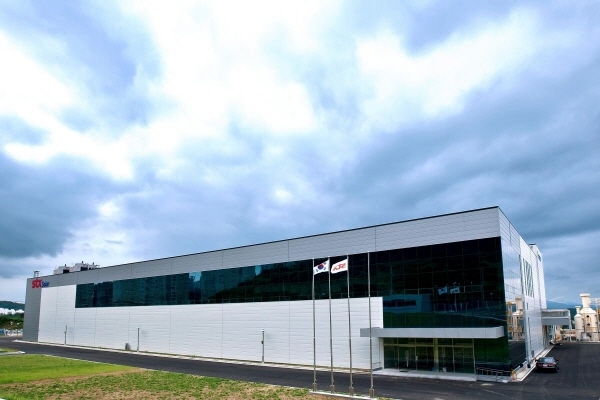 STX Solar has in Gumi Industrial Complex of Gyeongbuk a manufacturing plant with 180 MW of photovoltaic cells and 50 MW of photovoltaic modules. Generally, the reason for making a cyber FAB, a technique used in semi-conductor industry, is to shorten equipment ordering time in order to save time and reduce cost when demand is temporarily increased around the end of the year if a cyber line is prepared in advance. To be sure, there should be technical know-how before a cyber FAB can be made to enhance operation rate up to 98 %, and there should be technological capacity to increase the amount of production per hour from 30 sheets to 40 sheets. Only the companies that possess such superior engineering capability can devise a cyber FAB as the last resort production technique. This amply testifies the superior manufacturing capability of STX Solar. Caption: Front view of STX Solar Gumi Plant completed in September 2009. STX Solar works hard to attain manufacturing competitiveness in the field of high efficiency and high reliability solar cell mass production with its proven cost competitiveness. As can be seen in this attitude, CEO Choi firmly believes that Korean companies can maintain their competitive edge only when they aim for high efficiency and high reliability products. 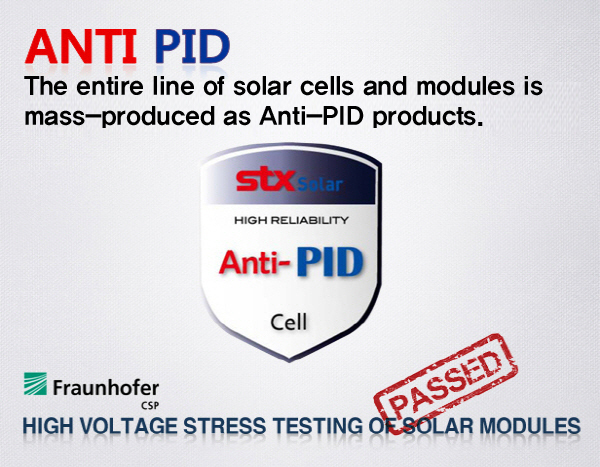 STX Solar mass-produces the entire line of its solar cells and modules as ‘ANTI PID’ products. As for the crystal substance, he said, “The crystal substance will maintain the present level for about 3 years, but it will become more competitive in price thereafter.” He continued, “The risk for thin film lies in the fact that the technological barrier is not very high. That is, there is a good possibility that facility investment will dictate its outcome. According to CEO Choi, this is because it is not easy for an early starter to enhance its efficiency in a competition with a late starter that invested less.